C is for coooooookies and cream macarons! — I’m back with another mac attack. Right when you thought that macarons were soooo 2016, I’m here to fight and say that they are here to stay. My Macarons 101 guide is now the most viewed post on the blog. I get tons of questions emailed and posted in the comments there, so I decided to make a few new tasty options using the same golden methods. 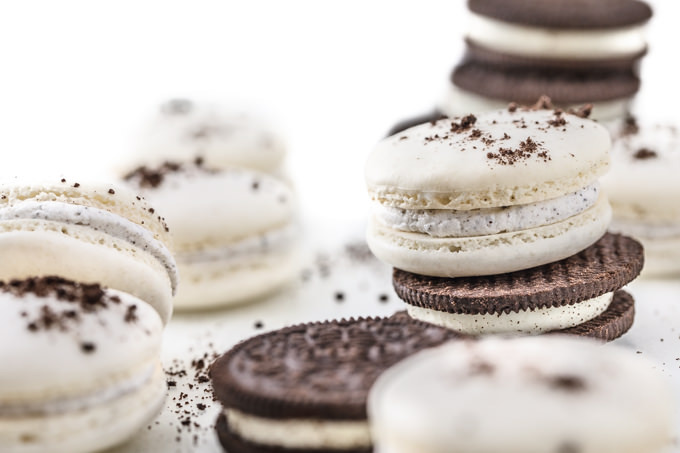 Classic white macs with Oreo buttercream are here. They taste exactly like the cookies. It’s almost scary how similiar they are. It’s that buttercream, y’all. 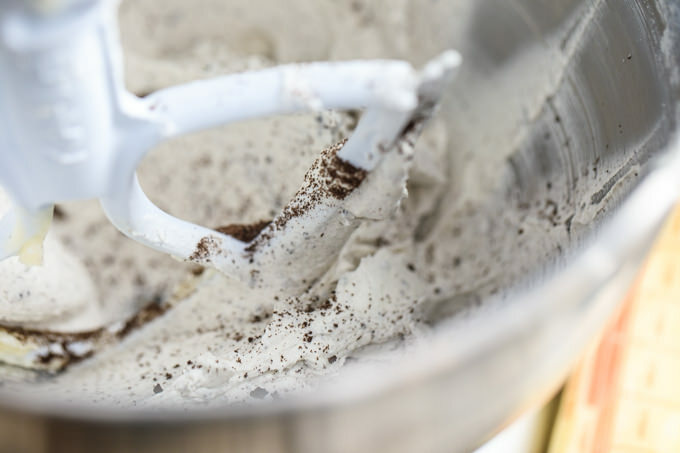 You can never go wrong with an Oreo buttercream. This buttercream. I can’t even begin to explain how amazing it really is. Incredibly fluffy, light, rich. Pretty much anything you can think of to say that describes classic nostalgia in a handheld treat. Plus, it gives you an excuse to destroy an entire pack of double-stuffed Oreos. It’s called recipe testing, which means it is healthy and stuff(ed). PS – Do you see that one Oreo that is flipped upside down? I found that in the pack that way. Weird. I just assumed it meant that I’ll have good luck, so I ate another couple cookies in celebration. 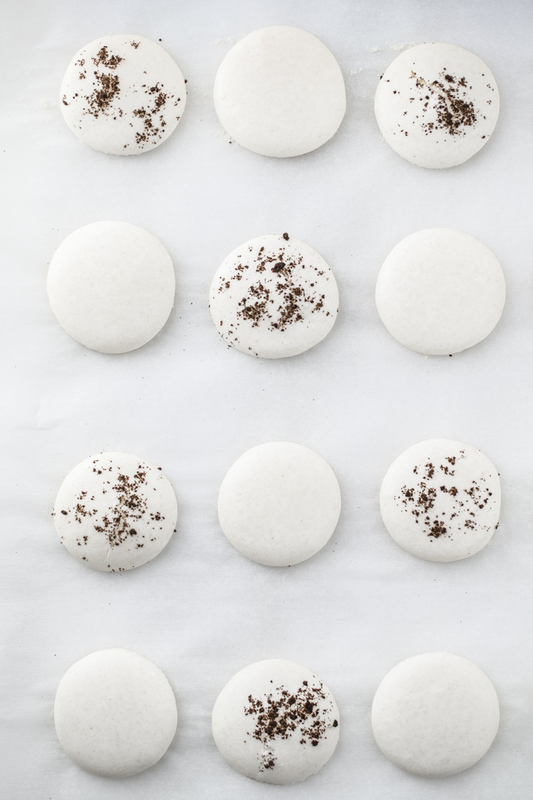 our Macarons 101: A Beginner’s Guide post before you get started. Psst — There’s even a printable piping template for free. 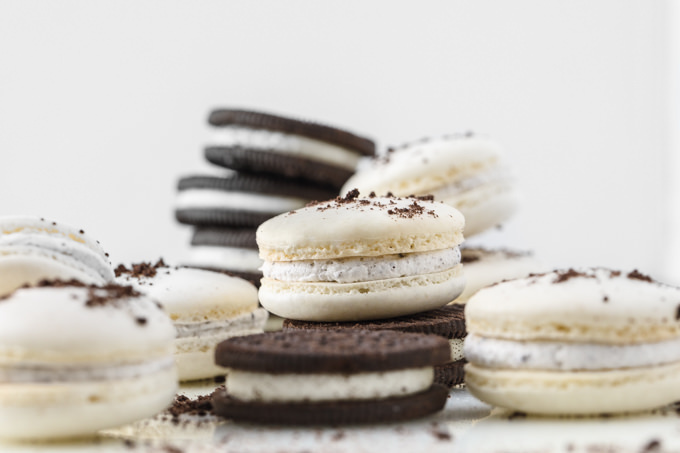 Cookies and cream macaron cookies recipe with the best Oreo cookie buttercream ever! From Southern Fatty. 12 tablespoons butter, unsalted, room temp. Split Oreo cookies from filling (see buttercream section) into two bowls. With whisk attachment, whisk at medium speed until foamy, about a minute. Add 55g powdered sugar and cream of tartar. Mix until just stiff peaks form. Add food coloring here if desired. Add a bit more than you think you need, as it will fade slightly when baking. In different bowl, sift together almond flour and 200g of confectioner's sugar. Repeat and sift a couple times, removing any large pieces left behind after each sift. Using proper folding technique (see THIS blog post for explanation of this), fold until you can ribbon an "8" that holds into the batter. THIS is the most important step in proper macarons. Visit the blog post for full instructions. Pipe macaron circles onto paper-lined baking sheets using the macaron template and instructions available HERE. Sprinkle lightly with fine Oreo shells. too much will cause issues with baking. Let the shells rest for an hour to form hardened tops. Bake at 290 F for about 15-18 minutes. Be sure your oven temperature is exact. Add Oreo filling, vanilla, salt. Add some of the blitzed cookie shells. Pipe between cookies and carefully assemble. 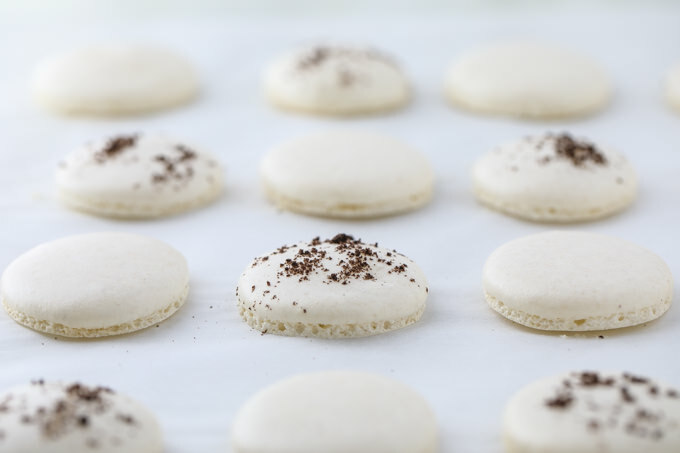 Check out our other macaron recipes HERE. 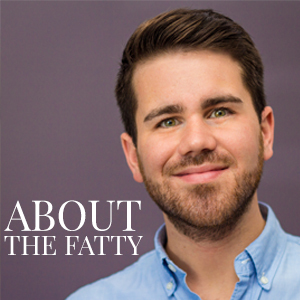 Are there any macaron flavors you would like to see on Southern Fatty? I made this recipe twice, the first time exactly as it is written and the second time I doubled the recipe. Both times they tasted great (everyone loved them!) and had nice ‘feet’, but both times they turned out hollow. Any ideas on why that could be?? P.S. The filling is KILLER!!!! Hollow macs can be the result of a few things… over or under whipping the whites (just to stiff peaks). The next critically important thing is proper folding of the batter. Folding here is important for a couple reasons… it allows the ingredients to be gently mixed, while also allows for you to properly deflate the mixture juuuuust enough to get a perfect consistency. The folding is where 99% of macaron failures go wrong. It’s less and less about the ingredients being this or that way, and almost all about getting the perfect viscosity. Fold and press some of the air out until you get a ribbon that you can “figure 8” that then slowly fades back into the batter. Most often, the folding is where the issues are. Don’t forget to check the oven temperature. You can drop it 5-10 degrees and add another sheet pan to the bottom of the macarons as well if the batter seems ok. In the recipe you say it calls for 55 grams of powdered sugar and 200 grams of confectioners sugar. They’re the same thing. Do you mean 55 grams of caster sugar and 200 grams of confectioners (powdered) sugar ? Sorry for the confusion. They certainly are the same thing, but the 50g is used in step 4, and the remaining 200g in step 6. Hope that helps. Good luck! Be sure to share your results with us on social media using #southernfatty / tagging @southernfatty so we can see! How do you test your macarons for doneness? I noticed this recipe says bake at 290° and your basic guide calls for baking at 300°. I have been having problem with spreading feet at higher temperatures. I want to be sure shells are baking long enough and not brown. I have a home standard electric oven. Great observation and question. The reason this recipe is quoted at a bit lower temp is because of the added crumbles on top of the cookies. I found in testing that the lower temp and added resting time before baking lessens the likelihood that they will collapse from the added weight of the crumbles. You wouldn’t think it would do much, but I had several batches fall in because of this. I would highly recommend an oven thermometer, especially for electric ovens. I use the same type and found my oven to be quite off in calibration until I started correcting with a thermometer. If you are having trouble with spreading, double check your oven temperature, and that you aren’t over-mixing. YES, these look incredible. 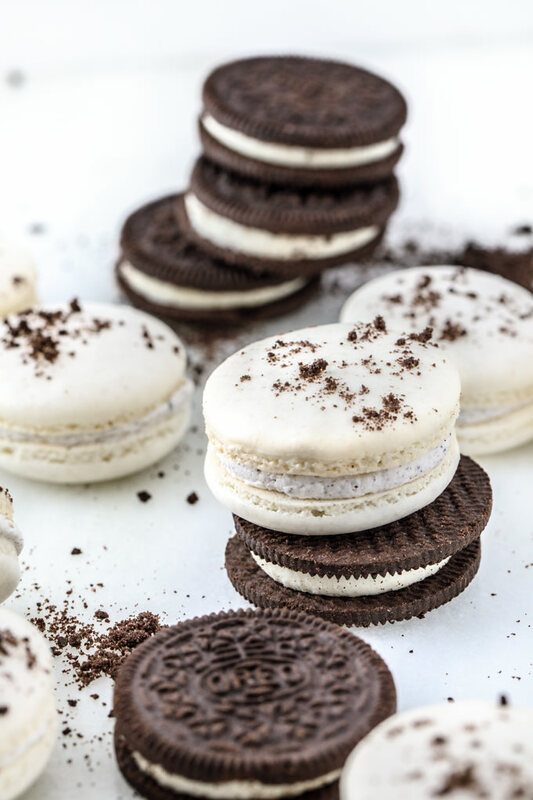 Oreos have always been one of my favorites, and these macs look better than the original. I’m not a crazy chocolate fan, but there is something magical about an Oreo. I hope those leftovers hold up until I’m home. What are leftovers? I don’t understand…. Love it! Hope they turned out great.